One of the things you absolutely don’t want to overlook for disaster preparedness is your toilet. While plumbing often does work during power outages and small-scale disasters, it wouldn’t take much for the plumbing system to go down. And, if it did, we could have a massive sanitation disaster on our hands. To make sure nothing hits the fan, you need an emergency toilet. One option is a camping toilet. 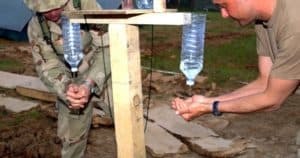 Most Camping Toilets Are Terrible for Emergency Prep! 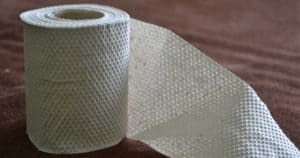 Before you rush out and buy a camping toilet and call yourself prepped, know that most camping toilets are terrible for emergency preparedness. They get messy. They fill quickly. And where the hell are you supposed to dump it when it’s full??? I personally would recommend a portable composting toilet instead of a camping toilet, or even a DIY composting toilet instead. 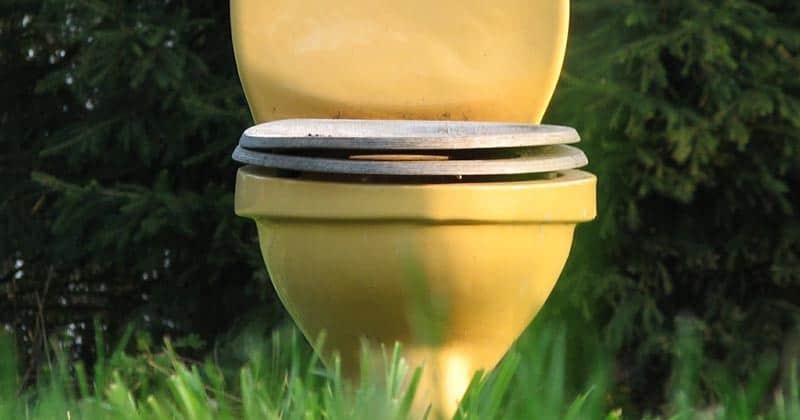 You can read our picks for the best composting toilets here. However, composting toilets are a bit pricey and you must have a compost heap to use them. So, a portable camping toilet might make sense in some situations. 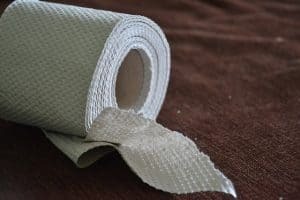 This guide will give you some good options for camping toilets and also troubleshoot all the issues with using them when plumbing is down. 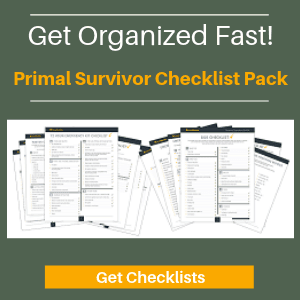 Best For: Short-term emergencies. These also work for longer-term emergencies, but buying that many bags can get pricey. Assuming that you only use for #2, plan for about 1-2 bags per person, per day. Best For: Longer-term emergencies, but only if you also have a place for emptying the tank (such as a yard where you can dig a pit). Camping toilets are essentially seats which have a collection device at the bottom. They can be broken down by the type of collection device that they use. On many websites, I’ve seen “bag” type camping toilets recommended for emergency prep. These are basically chairs with a toilet seat on them and a plastic bag attached below for collecting waste. The bag will break or leak. You will slosh yourself when you go to empty the bag. And where the heck are you emptying the bag? You’ll have to tie off the bags of waste and keep them lying around until authorities tell you how to get rid of them. Instead of going this route, I’d recommend the twin-bucket system. With the two-bucket system, you use buckets (which won’t leak or break like bags). 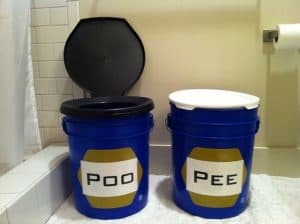 One bucket is used for pee and the other for poo. 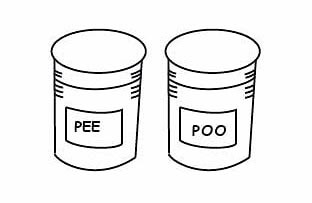 By keeping pee and poo separate, you eliminate all possible sloshing. The pee can be safely dumped outside. The poo doesn’t actually take up much space. It can be bagged up or dumped in a latrine. Read more about the twin bucket toilet system here. If you were completely unprepared for an emergency, you could use a bag toilet. It would be fine for up to a few days. After that, you’d end up with too many bags of human waste building up in your home. Gross, right? WAG stands for “Waste Alleviation and Gelling.” They are made by the company Cleanwaste (and are now called the “Go Anywhere Toilet kit, but most still refer to them as WAG bags). Many backpackers are familiar with wag bags because some national parks now require hikers to pack out their waste. They can be found on Amazon. The way wag bags work is with a special gelling agent. The gelling agent is either added to the bag or is already added to the lining of the bag. When liquid waste comes in contact with the gelling agent, it causes the waste to become solid. Disposing of solid waste is much easier since don’t have to worry about leakage or spills. Thus, you can easily carry the wag bag to a disposal site. For emergency planning, wag bags can work very well. You still end up with bags of waste laying around your home or yard. But the gelling agent means they won’t smell or be messy. Once trash collection resumes, you can just toss all of the bags. The only issue with wag bags is that they can be very expensive, usually around $10 per bag. Even if you are only using them for #2, the cost can still add up quickly. Buying them in bulk is much cheaper. The pack of 50 Go Bags we recommend below are quite affordable. The chemicals in wag bags render human waste inert. So, you can safely dispose of the wag bag in the trash. However, you should not put wag bags in latrines or composting toilets. I’m assuming this is because the bag won’t decompose and you’d end up with human waste festering in a sealed bag. Because wag bags and gelling agents are expensive, an alternative is to make your own wag bag using cat litter. You put a bit of cat litter in a sturdy plastic bag. When you go to the bathroom in the bag, the cat litter will cause the waste to become more solid. I haven’t tried this personally, but I’ve heard that the wood pellet cat litter doesn’t work well. The clumping clay type of cat litter works better. While this method is cheaper than buying wag bags, it can smell and disposing of the bags can be problematic. It is against the law to put human waste in the trash (even baby diapers aren’t supposed to go in the trash). So, you will not be able to put your waste bag in the trash (assuming that normal trash collection eventually resumes). You also won’t be able to dump the contents of the bag down the toilet once plumbing resumes because cat litter will clog toilets. If you didn’t use cat litter, you could dump the waste down the toilet – but I don’t even want to imagine how messy it would be to empty out plastic bags of human waste! The only way to safely dispose of DIY wag bags with cat litter in them is to bring them to an official dump station. Or, if you used a compostable bag, you will be able to put them in a latrine. Because of how complicated it is to dispose of DIY wag bags, they are not recommended for emergencies. Choose another option or invest in some wag bags with gelling agent. These bags are puncture-proof and have zip-closures. Each bag has a gelling agent or “poo powder” which renders waste inert and solid so it can safely be put in the trash. These types of toilets are often found on boats or RVs without built-in plumbing systems. The upper part of the toilet contains a bowl, seat and cover. There is also often a top tank which contains clean water or chemicals. This allows you to flush the toilet to clean out the bowl. The bottom part of the toilet is the waste-collection tank, or “cassette.” This is where all of your waste goes after using the toilet. Cassette toilets are designed so you won’t come in contact with human waste. When the tank fills up, you remove the tank and empty it. It varies by model, but there is usually a release valve or screw mechanism for opening the tank so you don’t have to get your hands near the waste. There will also be vents which can be opened when dumping waste. This reduces the likelihood that splashing will occur as the waste drains. These toilets are affordable and reusable. They are also incredibly easy to use and don’t require much water to empty the bowl. If you have a latrine, then emptying the waste is fairly simple and mess-free. Large models of cassette toilets will hold about 5 gallons of waste. It would take one person about 8 days to fill the tank. Or, for a family of 4, the tank will fill up about every 2 days. For short term disasters, this would be a fine solution. However, for longer-term disasters, it could be very problematic to find somewhere to dump the cassette every couple of days. Five gallons of waste is also very heavy. A full tank can weigh more than 40lbs. Some models have the tanks on wheels to make disposal easier. However, you still have to lift the tank, which can be problematic if you have a bad back or are injured. And while portable toilets are designed to reduce splashing, some splashing will inevitably occur. You can read horror stories online from people who had accidents while emptying their toilet tanks. Virtually all campgrounds will have a dump site for waste. If you used chemicals in the top tank of the toilet, then you’ll have to dispose of waste in one of these sites. You can’t dump toilet chemicals in the normal sewer system. If you just used water for flushing, then you can empty the toilet tank in any normal toilet. However, this can be very messy! The tank is often larger than the toilet bowl, meaning that the bowl can overflow. So, don’t let the tank fill completely before you empty it in a normal toilet. But what about during emergencies when plumbing is down? You’ll have to find or dig a latrine for dumping the waste. Or, you’d need to have multiple cassettes so you could switch to another cassette once the first got full. Waste tank capacity: You’ll want a tank which can hold at least 3 gallons. Otherwise you’ll be emptying the tank very frequently. 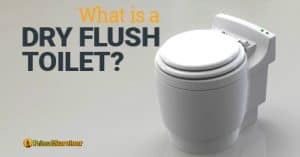 Non-electric flush: If you get a camping toilet which has a battery-operated flush, make sure it can also be flushed manually. Otherwise, you won’t be able to use the toilet if the batteries die. Mess-free pour spouts: The pour spout should have a vent so no sloshing occurs when you empty the waste tank. Water and waste level indicators: These are crucial so you don’t accidentally overfill the tank. Easy cleaning valve: This allows you to pour clean water into the top of the waste tank to flush it out. Thetford is the best-known name in portable toilets. They make a lot of products. The 365 is one of their newer models. It was designed to replace the 550P model. 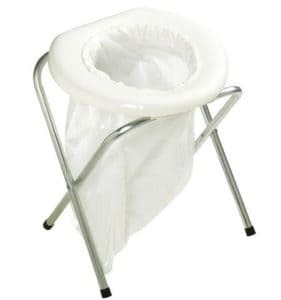 The good thing about the 365 Porta Potti is that it’s very easy to use. It has an intelligently-designed pour spout that doesn’t slosh or splatter (I know, it’s gross to think about!). A lot of people also like this toilet because it has an oval seat which is more comfortable than the circular seats of most camping toilets. *Note: Thetford makes a lot of great portable toilets but do NOT get an electric model for emergency preparedness. It can’t flush if the batteries go dead! I’ve also read that the flushing mechanism will often break, meaning you have to replace the entire toilet. The SereneLife SLCATL320 portable toilet is pretty similar to the one by Thetford above. It also has features like a waste level indicator, piston flush, and an oval seat. What makes it different? The fresh water tank is a bit smaller, which is okay because it uses slightly less water for flushing. To keep the bowl clean, the water is dispersed with a 3-way system. The only real downsides of this toilet is that some splashback can occur when flushing. To prevent this, put a bit of toilet paper into the waste tank before using the first time. Also, it can be a bit tricky to completely empty the cassette. The waste tank has weird indentations in it where waste can get trapped. So, you have to tilt the tank in many directions to get everything out. For this reason, I’d recommend paying a bit more for the Thetford model above. One of the main downsides of portable camping toilets is that you need water to flush them. Instead of wasting your valuable fresh water for flushing, you can use recycled gray water. This portable sink/toilet combo makes it easy to recycle gray water. Here’s how it works. When you wash your hands in the sink, the water flows into the toilet’s fresh water tank. This water is then used for flushing. You can also buy a portable camping sink separately and just attach the waste-water pipe to the toilet. However, you save money when buying them together. You also don’t have to worry whether the outlet and inlet pipes will be compatible. What emergency toilet do you have? Let us know in the comments. If cow manure can be used to start fires, is it safe to burn poo? Just poo . Burning human waste requires very high temperatures and an accelerant so not really a feasible solution for most use cases.